Spiced pear and apple crumble with vanilla ice cream, originally uploaded by kmcgivney. As I mentioned in my last post, our original Thanksgiving plans to escape the country and its litany of Black Friday advertisements were thwarted by my sinuses, so we decided to stay home and make ourselves a little mini-feast. Since it was just the two of us, and one of us is a vegetarian, we didn't want to make a turkey, so instead I made chicken and Atom made something called Match, which is a meat alternative product that is meant to look, taste, and cook like meat. We also made vegan pumpkin bread, gougeres, roasted brussels sprouts, sweet potato & roasted garlic mash, and spiced pear and apple crumble. I'll be posting a couple of the other recipes later this week. Photos of the whole dinner and the recipe for the spiced pear and apple crumble are after the jump. Belgian beer is strong, originally uploaded by kmcgivney. 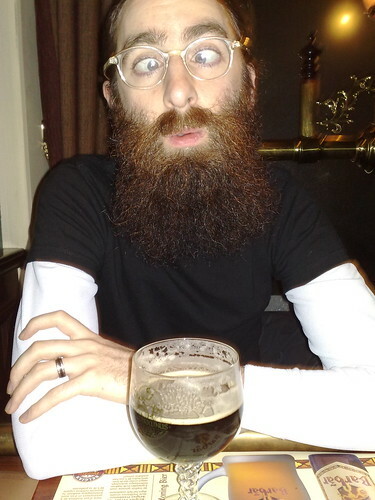 When my lovely husband (pictured above) and I first started dating, I traveled a lot for work. He quickly obtained a passport and adapted to my insane travel schedule, often accompanying me on trips to conferences. Towards the end of that year, we realized that we had no vacation days left, but both of our employers conveniently gave us both Thanksgiving day and the following Friday off. So, we did what every travel-addicted nutjob would when they find themselves with a long holiday weekend off - we went to Europe and visited friends in Belgium. This became a tradition for us, and each year since, we have gone to Europe for Thanksgiving, thus avoiding having to make the difficult choice as to which family members win the Kat and Atom lottery*. The first year, we went to Belgium and visited Liege and Bruges; the second year, Italy, where we visited Rome, Orvieto, and Florence; and last year, Belgium again, where we visited Antwerp, Bruges, and Brussels. This year, we had a trip planned to London, and were scheduled to fly out yesterday. Unfortunately, my immune system got wind of this and went out and picked itself up a hefty virus**, and I didn't feel well enough to travel, so we are staying home and cooking ourselves a tasty Thanksgiving feast, which I'll hopefully be coherent enough to photograph tomorrow (which will likely depend on the levels of cold medicine in my blood). In the meantime, I thought I'd share some photos from our past European Thanksgiving trips. Enjoy! *Our egos aren't actually THAT big. It's more like Kat and Atom Russian roulette. **Not pigflu. How do I know? The internets said so. Cathedral of Our Lady, Antwerp, interior, originally uploaded by kmcgivney. We were last in Antwerp in November, as part of our annual Thanksgiving trip to Europe. This started a few years ago when we both realized that we had no vacation days left, but that our respective employers declared both Thanksgiving and the following day a holiday, thus giving us a 4-day weekend to spend anywhere we wanted. So, naturally, we flew to Belgium to visit friends. The following year, we went to Italy to cheer on a friend running a marathon, and this past year, we just decided to explore Belgium a little more and get all of our Christmas shopping done early (with you guessed it - chocolates for everyone). 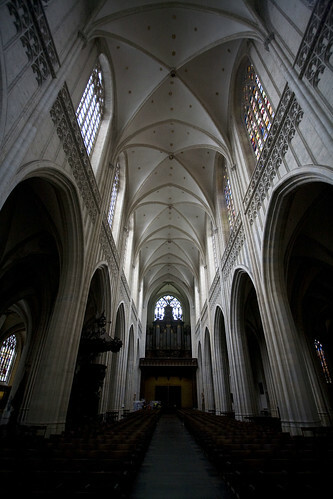 This photo of the interior of the cathedral in Antwerp was taken in November with a Canon 5D (first version) and a 17-40mm f4 lens. There are several more photos in my Belgium set on Flickr, which includes photos from our first trip to Belgium as well. Since we have the 5D Mark II with us this trip, I expect there will be a few more there in the next few days. Tinkerbell, originally uploaded by kmcgivney. Meet Tinkerbell. Tinkerbell is one of my dad's two cats. Since he's been sick, I have been spending a lot of time at his house, and of course the cats are always around to make things interesting. 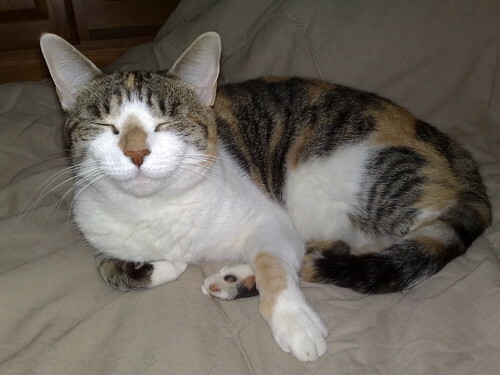 Of the two cats, Tinkerbell is the more independent one. Her buddy, Melvin, is a rotund black cat with a cauliflower ear who merits his own follow-up post. Melvin is much more social than Tinkerbell and will greet anyone who has hands (because hands are for petting him). Tinkerbell, on the other hand, prefers to do her own thing and will hang out in the basement most of the day, or find a pile of soft-looking blankets and burrow into them. When she decides to be social, strictly on her own time schedule and terms, she will climb right up into your lap, provided that you are worthy. She has very high standards. This photo was taken by my awesome husband while Tinkerbell was lounging on my dad's bed, awaiting his return from the hospital. We had just been lavishing her with attention. She was very pleased. More Tinkerbell, and other cute animals, in my animals set at Flickr. Mia strikes a pose, originally uploaded by kmcgivney. This is Mia. Atom's friend and groomsman Steve and his wife Joline are Mia's owners. During a recent trip to Boston, we took a nice walk from our hotel in the Back Bay through the Fenway and over to their apartment, and spent a little bit of time lounging and chatting, but of course, Mia was incredibly photogenic and charming, so we spent a lot of time taking photos of her. 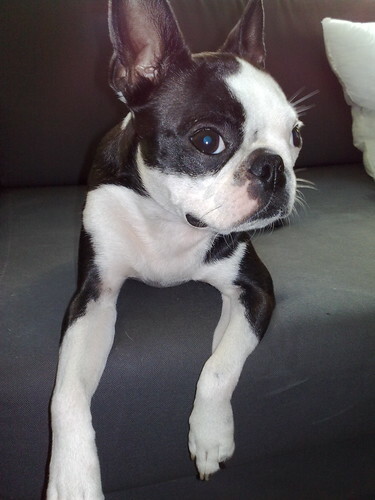 Boston terriers are usually small, but Mia is smaller than most. She's very active and wiggly. Those who are lick-averse would do well to avoid her, as she is very prone to licking humans. This shot was taken after she had worn herself out a little bit. Being a hostess can be quite exhausting. On a personal note, though things are not entirely back to normal, I will be resuming a fairly regular blogging schedule. I have a lot of photos and information to overshare with the internet! 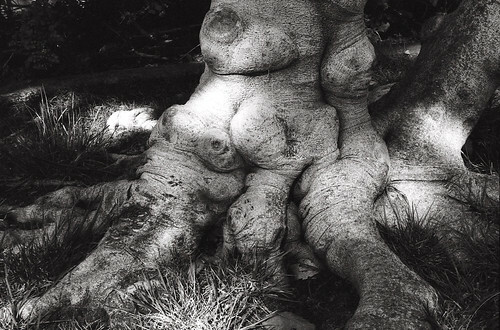 Roots, originally uploaded by kmcgivney. I've been going through a lot of film negatives lately, some new, some old. I used to shoot tons and tons of black & white film, and I miss it. Looking at some of these negatives has inspired me to pick up one of my old Leica SLRs and run a few rolls of b&w through it. Since I have a better scanner now (his name is Atom and he procrastinates much less than I do) I should be able to post more film shots soon. This image is one of my favorites from my film archives. (Calling them "archives" rather than "piles of old negatives" makes it sound fancy and organized.) I took it while walking around the grounds of St. Vincent de Paul Catholic Church near downtown Los Angeles. A friend of mine and I were out shooting just to see what caught our eye. As we were walking around the grounds, I saw this knotty old tree behind the church near the rectory, with its bulging roots displacing parts of the nearby sidewalk. I thought it was an interesting subject and I liked the way the light was hitting in only in certain places because it was streaming through the branches of another nearby tree, so I captured the image. If I recall correctly, I was using fairly high-speed black & white film, not because I was working with low light but because I like the large grain in higher-speed films. Sometimes a grainy look can impart a certain aesthetic to a photograph that I find appealing. For example, another image that I shot during this outing is of a side of a building and some trees and landscaping next to it; the grain in the image makes it look as though it was taken 80 years ago rather than with a modern camera. It gives it an artistic, somewhat painterly quality that I really like in a photograph. More scanned negatives coming soon, as soon as my scanner gets home from work! Statue of Liberty, originally uploaded by kmcgivney. During our recent visits to Los Angeles to clean out the stuff from my old place, I found an old desktop computer that I hadn't booted up since early 2006 or so. On it were some scans of some negatives I shot a few years ago, when I was primarily shooting film. I still shoot with film cameras, though not nearly as much as I used to since digital is more convenient for me on my frequent travels. However, I do love using film and looking at old images I've created help me remember just how much. 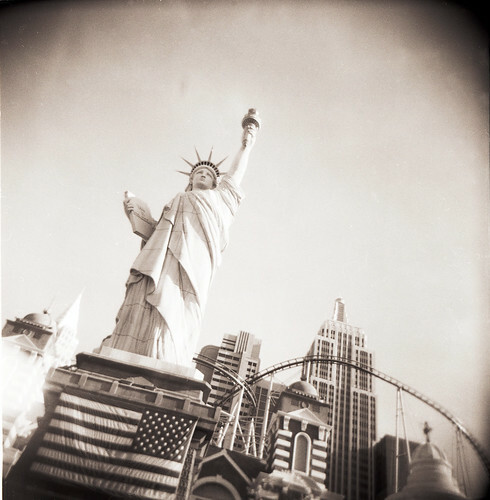 This image of the New York New York Casino was shot in 2003 in Las Vegas with a Holga. Holgas are medium-format, cheap plastic cameras with plastic lenses that yield images with soft focus, vignetting, and light leaks. They're really fun for creating artistic, sometimes weird images. The image was scanned as a negative so it looks backwards, but I didn't bother reversing it. I think it looks a little more surreal this way. 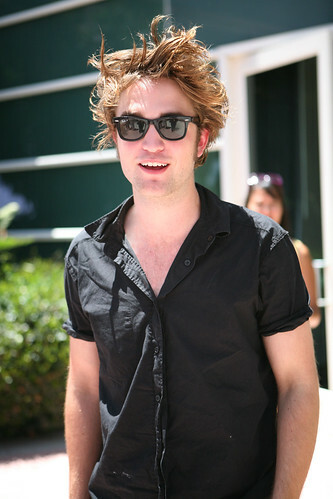 Robert Pattinson, originally uploaded by kmcgivney. I used to go to the San Diego Comic Con every year. I started going in 1993, when the convention (and the convention center) were much smaller. Since then, it has expanded quite a bit, to include movie and television promotions and huge booths, not just from the usual suspects like DC Comics, but other media like the Sci-Fi channel and Sony. This year, I found myself with only one day to devote to the convention, so I headed down on Thursday. My main reason for being there was to photograph the cast of Twilight, particularly Kristen Stewart, for an article for Premiere. I met up with my awesome journalist colleague Pamela Chelin and joined her for a roundtable interview session with the cast, a short photo session outside the interview room, and their panel to discuss the movie. As I was mainly there to capture the leads, Kristen Stewart (photo also included in the article on Kristen at Premiere) and Robert Pattinson (pictured above), and had limited time, I didn't capture all of the cast, but there are a few more candids and some shots of the panel in my Twilight set at Flickr. More Comic-Con fun, nerdy goodness, and links to good-looking people after the jump! Gama-Go shirt, originally uploaded by kmcgivney. I was in San Diego for the first day of Comic-Con on Thursday and was walking around with my writer friend Pamela as we waited for our scheduled meetings. We stopped by the Gama-Go booth because I love their stuff and buy my husband a LOT of their t-shirts. 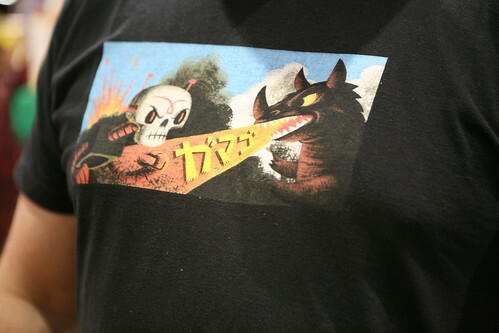 One of the staff at the booth was wearing this old Gama-Go design, which he said was discontinued because people kept mistaking the Katakana lettering for Hebrew. We sent it on over to Heeb Magazine, who collects such items for their Jewish esoterica archives (or perhaps just likes free t-shirts).